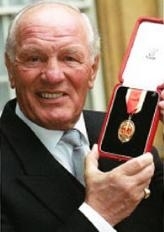 Henry Cooper was one of the Greats of British Boxing. He was also one of Britain?s best loved sportsmen; known affectionately as "Our 'Enry" . He was also a traditionalist in the best sense of the word. In his home there was a large photo of the late Queen Mother and he was always delighted when he was invited to Buckingham Palace by The Queen and Prince Phillip. He was a devoted family man and a real friend to those who had the pleasure of knowing him intimately. Henry was born in Bellingham, South London. He, his identical twin brother, George, and elder brother Bern Henry went to the Athelney Road School in Lewisham. The Cooper brothers were particularly close growing up and, in his biography, Henry talks of how they came to each others aid when things turned nasty in the school playground. The only subject that seemed to interest Henry was history. However, during the War the brothers were evacuated to Lancing in Sussex. Their half-Irish grand-father sold horses in the Elephant & Castle area which had been famous for many centuries for horse fairs and sales. Their father was also very keen on horses. The great passion of the brothers was sport. "Golf balls were scarce so we'd nick them from the fairway, run round to the clubhouse and sell 'em back to the grateful members for a tanner" (6p). Henry was later to become the Chairman of the golf section of the Variety Club Children's Charity. As an amateur with the Eltham Boxing Club Henry won 73 of 84 contests, including the ABA light-heavyweight championship in 1952. That year at the Olympic Games in Helsinki, he suffered a second-stage points defeat to the Soviet boxer Anatol Petrov. The French judge awarded Cooper the verdict, but the other two judges, both from communist counties, came down the other way. George and Henry became professional after completing their National Service, George boxed under the name Jim Cooper. Henry's boxing career has been covered in great detail in many newspapers and on the internet so I do not need to repeat his successes here. The most famous match in his career was the fight in 1963 when Henry floored Muhammad Ali. Sadly, one of the great drawbacks of Henry fighting career was his tendency to 'cut' easily; and many a fight was lost because of this weakness. Overall, Henry's record was unmatched by any British fighter of his or any other time, winner of 40 of his 55 contests, 27 by knock-out. In a 17-year career from 1954 to 1971, he was the winner of three Lonsdale Belts. Henry had a strong regard for the boxers of his generation but in his later years he became very saddened by what he saw as tawdry dealings in 'overweight punch slingers' with little of the skill that he had prized. Henry married Albina Genepri in 1960. He adopted her Catholic faith. They had two sons, Henry Marco and Jonathan Pietro. In retirement Henry filled his time making numerous public appearances and playing a decent game of golf. He was a charming companion who was always prepared to give his time to young and old, especially on behalf of the many charities he supported. A particularly generous action, which was typical, was when he was offered �10,000 to make an after-dinner speech. He discovered that the date clashed with an unpaid appearance at a Boy's Club which he had given his word that he would attend. He unhesitatingly refused the fat cheque. Henry was a good boxer, but an outstanding man. He was awarded the O.B.E in 1969 and was knighted in 2000. In 1978 was also awarded a Papal Knighthood of the Order of St Gregory.